Our Japanese kites are made from high-quality paper using traditions handed down over the centuries. This beautiful kite depicts the title character from Sukeroku, among the most popular and famous of kabuki plays. 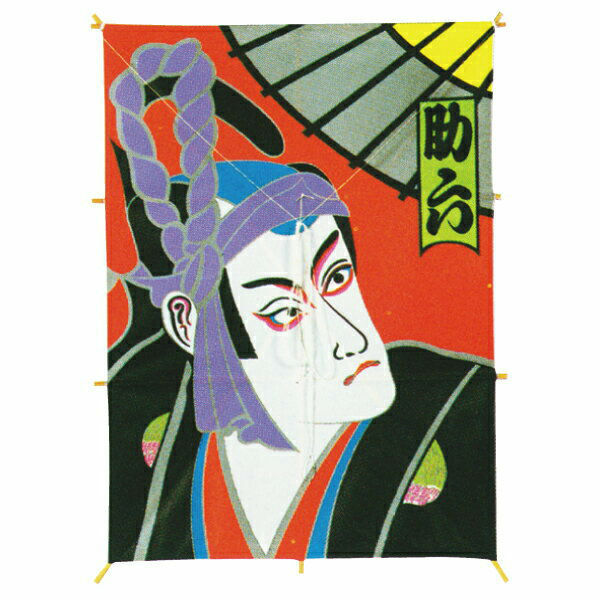 Japanese kites are often square or rectangular in shape with a colorful design of a samurai warrior or kabuki character emblazoned on the front. Japanese kites are traditionally flown in spring and at special kite-flying festivals. They were first for religious purposes and symbolize good luck, fertility, and prosperity. Kites were thought to scare away evil spirits. There is no size information available for this product. Please check the product images, where there may be a size chart. Note: The estimates below are intended only as a guide and are based on a single item of average size. You will be shown the actual shipping cost in your shopping cart before you complete the checkout. Same Day Dispatch In stock, sent the same business day (depending on quantity). Pre Order Order items arriving soon. In Stock In stock at our warehouse. Usually sent in 1-3 business days. In Stock (2-5 Days) In stock with manufacturer. Usually sent in 2-5 business days. Awaiting Stock New stock ordered, awaiting delivery. On Backorder Temporarily out of stock. Contact us for expected ship date. Out of Season Product available only during a certain season eg. winter. Out of Stock Item no longer available. We have no time-frame for its return. Check availability Contact us. Due to the wide variety stock changes often.